Thousands walked through the streets, cheering, waving Zimbabwean flags, greeting soldiers as heroes, and taking selfies with military personnel in armoured vehicles. Exuberance, not fear, ruled the streets of Harare. Members of Parliament, including those from the ruling party, Zanu-PF, ululated and danced in the aisles. Mugabe's speech at Zimbabwe's Independence in April 1980 focussed on peace and reconciliation. It drew sighs of relief from white Zimbabweans and the West. Mugabe was eloquent, highly educated, and seemed eminently reasonable. He was the very model of a modern African leader — a technocrat and the antithesis of corrupt, venal leaders such as the Congo (Zaire)'s Mobutu Sese Seko. The West swooned. Viewed in hindsight, however, all was not well. Mugabe's control of the media coupled with global attention moving on to other hotspots in the mid-1980s obscured the trouble in Zimbabwe. Ethno-political tension between Mugabe's Shona-dominated Zanu-PF on one side and Nkomo's Ndebele-focussed-PF Zapu on the other devolved into a conflict that killed as many as 20 000 people in the mid-1980s. In 2013 and 2018, Joc co-ordinated more sophisticated means of fixing elections, including manipulating voter registration and the voters' rolls. These measures were so successful in the 2013 election that people were elected on the ruling party ticket who did not even know they were running for office. 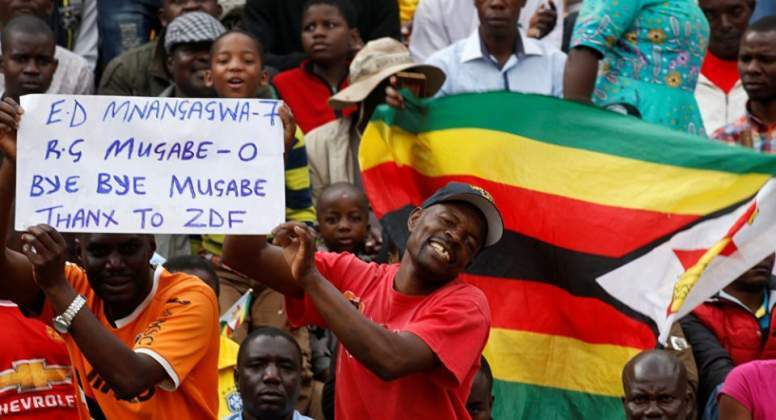 Even diehard Zanu-PF supporters were stunned by the 61-35 margin of their party's victory. Younger members of the ruling party — some technocrats and some opportunists — began to challenge the old guard. This group of younger government officials and business people aligned itself with Grace Mugabe and became known as the "Group of 40-Year-Olds", or "G40". On November 15, Major General Sibusiso Moyo spoke to the people of Zimbabwe via state television and radio. He denied that there had been a coup and said that the military was "only targeting criminals around (Mugabe) who are committing crimes … that are causing social and economic suffering in the country". Lieutenant-General Moyo, who had taken to the airwaves on November 15 to re-assure Zimbabweans that no coup was underway, became Foreign Affairs and International Trade minister. Air Marshal Perence Shiri, former commander of the North Korean-trained Fifth Brigade, became Minister of Lands, Agriculture and Rural Resettlement. Lt Gen Engelbert Rugeje became the national political commissar for Zanu-PF. Perhaps most important to ordinary Zimbabweans, the predatory actions of the Zimbabwean police — seeking bribes at road checkpoints every few kilometres — stopped. What Mnangagwa and Zimbabwe needed to fully quell the coup/no-coup debate, or show that a coup could be a good thing, was a peaceful, transparent and credible election. Only through such an election — scheduled for July 31 2018 — could Mnangagwa's government be certified as legitimate. The Zimbabwe Electoral Commission (Zec) did not appear to be independent of the government and declined to be any more transparent than strictly demanded by the law. Procurement and printing of ballots — a sensitive topic in Zimbabwe — was undertaken in secrecy, and the final ballot did not adhere to Zimbabwe's own standards. As the events January 2019 have shown — the grossly disproportionate use of police and military force to stop protests and looting — Zimbabwe's government/ruling party remains willing to do whatever it takes to remain in power. As in Zimbabwe, coups generally leave the judiciary alone in exchange for some sort of court ruling that legitimises the military's undemocratic action. And therein lies the greatest problem for coups. Once the courts legitimise a coup — an unconstitutional transfer of power — the bar is set lower and it sets a precedent for future coups.